The reshaping of our Navy's force structure has had a significant impact on the number, focus, size, and capabilities of our carrier air wings (CVWs). The current force of ten active carrier air wings and one reserve air wing is based on the Department of Defense Bottom-Up Review of 1993. To afford this number of air wings, and to equip them with modernized aircraft, the Navy has restructured their composition. Force reductions, service life extensions, and judicious procurement combined with a reduction in the number of aircraft on each carrier have resulted in carrier air wings comprising 50 high-performance, multimission capable strike-fighter aircraft. Retirement of the venerable A-6E Intruder and the transition to a mix of F/A-18 Hornets and F-14 Tomcats is essentially complete, although two air wings will operate with an additional F-14 squadron as an F/A-18 placeholder until the Fleet introduction of the F/A 18E in 2001. Also, under the terms of the Department of the Navy's Memorandum of Agreement on TACAIR Integration, as many as four Marine Corps F/A-18 squadrons will deploy with Navy carrier air wings. The carrier air wing's multimission capability is considerable in terms of flexibility, effectiveness, and sustainability. 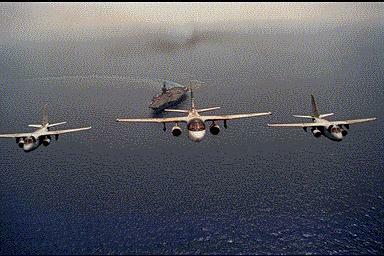 The tactical support provided by the electronic warfare capabilities of the EA-6B Prowler, the multi-purpose, multi-sensor capabilities of the E-2C Hawkeye, and the expanded surveillance and reconnaissance role of the S-3B Viking and ES 3A Shadow aircraft make the air wing the most capable power projection team ever assembled. The C-2A Greyhound provides carrier onboard deliveries necessary to sustain the air wing and other battle group assets. Completing the air wing mix are the SH-60F and HH-60 Seahawk helicopters, which provide multimission close-in support and Combat Search and Rescue (CSAR). The accompanying charts depict the numbers and types of aircraft that will comprise our carrier air wings in the coming decades.